The free trade agreement between China and South Korea will have an indirect yet positive impact on the Russian economy. Russia needs to be a part of free trade zones and integration projects in East Asia. The signing of a free trade agreement (FTA) between South Korea and China has wider implications for all of East Asia, and by extension Russia. The FTA calls for the eventual waiving of tariffs on over 90 percent of the goods traded between China and South Korea. It can help increase South Korea’s GDP by almost one percent over the next ten years and create up to 50,000 new jobs over the same time period. It can also become a ‘channel’ for South Korean companies to enter China, a country that has a GDP that is eight times larger than South Korea's. The FTA will create new opportunities and challenges for both China and South Korea. It would most likely lead to increased domestic competition for Chinese products. Meanwhile, South Korea is worried about the risks to many of its domestic industries, especially agriculture. "Does this mean we will have to eat Kimchi made in China," many South Koreans ask. Korean farmers will probably demand an increase in subsidies after the free trade agreement goes into effect. 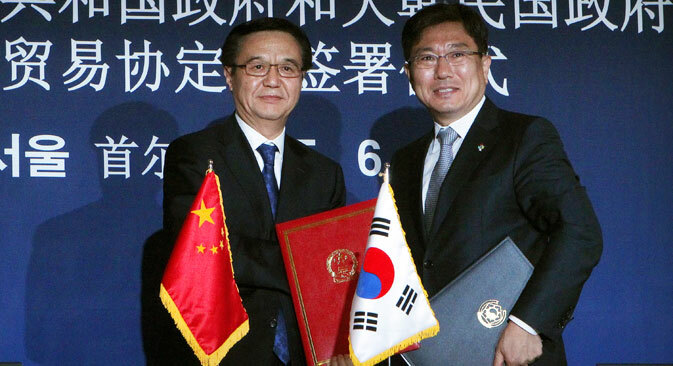 Moreover, the agreement may complicate the creation of a trilateral free trade zone between China, Japan and South Korea. The economies of the three countries are greatly interdependent and if this ambitious project is realized, it will radically change the regional and global economy. 55 percent of the world's economy would come under a China-Japan-South Korea free trade zone. At the moment, Japan needs to build on agreements reached between China and South Korea. The signing of the free trade zone agreement between China and South Korea may also complicate region-wide integration initiatives, including the Free Trade Area of Asia-Pacific (FTAAP), the Regional Comprehensive Economic Partnership (RCEP) and the project being promoted by the U.S., the Trans-Pacific Partnership (TPP). For now, Seoul has decided in favor of the China-promoted concept of economic integration in the Pacific Rim. This concept, unlike the TPP, is focusing not on intensifying trade liberalization, but on strengthening transparency and trade facilitation. Russia is seeking to create a just, sturdy and balanced trading and economic system in the Pacific Rim. Moscow wants a system that would respond to the priorities of the Russian economy, especially its export-oriented industries. That is why the South Korean-Chinese FTA will most likely have an indirect yet positive impact on the Russian economy. South Korea surpasses China in technological potential, which is why the Kremlin sees it not only as a country where to export energy resources but also as an economic partner that is capable of participating in the development of Western Siberia and Russia's Far East. China is still the biggest trade partner for the countries of northeast Asia: South Korea, North Korea, Japan and Russia. Its economic orbit attracts many countries in the region, like India, whose volume of trade with China can be compared to that of Russia, and stands at almost $100 billion. Beijing wants to involve many countries in its new Silk Road, project, which looks to bring Eurasian and Pacific Rim countries together. For Russia, it is important to join the talks on the creation of free trade zones and integration projects now, while the rules of the game are being elaborated, in order to guarantee its economic interests as best as possible. This is important not only for Russia's participation in Asia-Pacific economic integration, but also for Eurasian integration within the Eurasian Economic Union (EAEU) framework. The EAEU is beginning to strengthen inter-member cooperation to find and consolidate a competitive niche among the world's economic giants, such as the EU, Southeast Asian countries, the U.S. and China. Dr Vladimir Petrovsky is a member of the Academy of Military Sciences and chief scientific collaborator at the RAS Institute of Far East.